Despite the potential disruption and cost, litigation is an inherent reality in today’s market. Business disputes can arise out of employee conflicts, contractual disputes between companies, personal injuries caused by products, and other business-related issues. Our Mesa business litigation attorneys at Tait & Hall Law Firm recognize that commercial litigation forces businesses to divert their attention from clients and customers to negotiating disputes and courthouse distractions. Our experienced business litigators know effective legal strategies must be based on a deep understanding of successful commercial practices and principles. Our law firm provides effective and efficient dispute resolution strategies for a broad range of companies ranging from small or medium sized companies to large publicly traded businesses involved in highly complex commercial litigation. Our attorneys work diligently to protect the rights and interests of business clients while mitigating litigation risks. Our attorneys analyze potential legal claims and accompanying liability so that we can provide sound legal advice regarding the best strategies for a positive resolution. These strategies often involve forms of alternative dispute resolution (ADR). Although our partners have a long history of successful litigation results, including prevailing in trials, they aggressively pursue litigation alternatives that eliminate the necessity, disruption, and cost of a trial. These alternatives might include informal negotiations, arbitration, or mediation. When evaluating a structured settlement, we review immediate and long-term regulatory concerns, tax implications, and insurance issues. Despite our law firm focus on efficiency in preventing protracted litigation and recognizing risks by use of ADR procedures, we are prepared to tenaciously pursue our clients’ goals in the courtroom if these other approaches do not lead to an acceptable outcome. Our twin goals are to mitigate uncertainty and risk by assessing all possibilities, probable range of outcomes, and strategic options while proceeding both efficiently and expeditiously. As our law firm works to resolve your legal dispute, we also strive to limit the adverse effects that can compromise your business and disrupt your bottom line. From the moment our law firm is retained to handle a commercial dispute, we begin devising a strategic plan that comports to this dual philosophy that bases a “win” on maximizing the goals of our clients with the least adverse impact. Our exemplary track record of success, responsiveness to client needs and inquiries, and firm philosophy of defining success according to our client’s objectives has enabled Tait & Hall Law Firm to develop a reputation as a leading commercial law firm in the region. Although many of our business cases settle before the matter ever sees the inside of a courtroom, our commercial litigation lawyers in Mesa, AZ recognize that the best outcomes entail preparing every case for trial. Our resolve, preparation, and tenacity have fueled our firm’s esteemed record of successful resolutions. Our Mesa business litigation law firm represents entrepreneurs and businesses in Mesa and throughout Maricopa County. We recognize that all businesses likely will face a legal dispute at some point even if their operations are conducted legally, ethically, and fairly. Because business disputes often have a negative impact on business goodwill and productivity, we look to resolve our clients’ issue expeditiously while prioritizing their legal rights and goals. 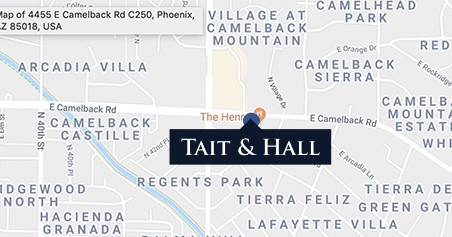 Contact Tait & Hall Law Firm at (480) 405-6767 or send an email to discuss your concerns.